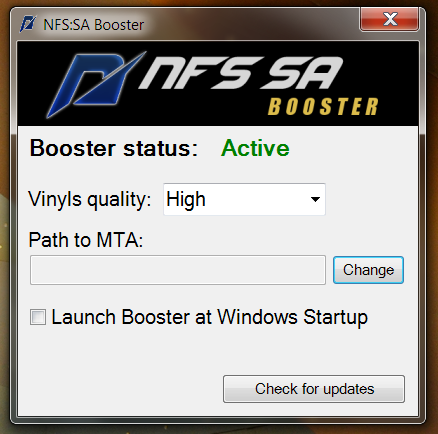 NFS:SA Booster is an Windows application, which works in background and connects with NFS:SA script to reduce lag spikes, reduce memory usage and increase general performance and vinyls quality. Main reason why lag spikes happen on our server is that MTA doesn't support creating textures in background. When there is need to render new car, MTA must freeze whole game for several frames to be able to create required textures. To reduce this effect, we have to use heavy textures without compression and in lower quality which is not efficient way and requires much video memory. NFS:SA Booster changes it. When there is need to render new car and Booster is active, script sends command to Booster which creates textures in background and sends back to script without freezing game! Remember that Booster is optional. You still can play on NFS:SA without it and it will never change! My antivirus says that Booster is dangerous! Booster doesn't affect MTA process. It uses shared files to communicate with script and this is 100% safe. You'll never get banned for using this. While using Booster, vinyls quality settings from server are ignored because Booster uses own quality (you can change it in program). After changing vinyls quality in Booster, it is recommended to do /reconnect. Remember that Very High setting is available only via Booster but this is still experimental feature. Please check this general thread. Added support to vinyl system changes and colorable decals from update 13-14.07.2018.